Sooner or later you knew someone would be crazy enough to feature the contrabassoon performing popular jazz standards. Well, here it is, Contradiction, the CD, puts the contra out in front and in your face with studio orchestra, various jazz combos and in trio setting with marimba and jazz guitar. Foolishly flying in the face of ferocious industry niche marketing, it includes smooth jazz pieces and one piece whose category is definitely murky. Some may think they know what a contra sounds like and some may even be willing to admit knowing what one looks like, but this CD will shake such preconceptions to their foundations. 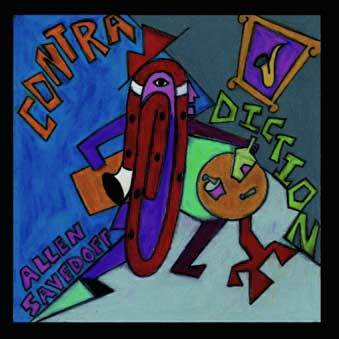 Contradiction features the delicately fluid contrabassoon stylings of Allen Savedoff, the wickedly witty arrangements of Kim Scharnberg and the musical talents of many of LA’s finest free-lance freeway warriors. Michele Richards, AnnShiau Tenney, Vivian Wolf. Ovsep Ketendjian, Jayme Miller, Dennis Molchan. viola: Dmitri Bovaird, principal; Margot Aldcroft, Suzanna Giordano, Lynn Grants, Carolyn Riley. cello: Sebastian Toettcher, principal; Catherine Biagini, Judith Johnson, Mary Anne Steinberger. bass: David Parmeter, principal; Tom Peters. flute: Heather Clark, Ruth Kasckow. oboe: Jon Clarke, Kathleen McNerney. clarinet: Gary Gray, Bob Crosby. bassoon: Carolyn Beck. horns: Steve Durnin, James Taylor, Jim Patterson trumpet: Burnette Dillon. trombone: Michael Hoffman. percussion: Judy Chilnick, Timm Boatman. Jazz contrabassoonists never have been exactly in high demand, but that hasn't stopped Savedoff from releasing a thoroughly charming recording on which he defies the presumed limitations of the instrument. Bringing a touch of humor to practically every track, he swings buoyantly on a whimsical merger of Leonard Bernstein's waltz "I Feel Pretty" and James Brown's famous shout "I Feel Good" to come up with "I Feel Pretty Good." The idea may sound farfetched, but the combination of Kim Scharnberg's witty arrangement and Savedoff's double-reed virtuosity produces a carefree music that can't help but make the listener smile. Great music-making doesn't always have to be deadly serious, a point that Savedoff makes with nearly every joyous phrase he plays. Contrabassoon advocate and humorist Allen Savedoff spoofs several genres of music including smooth jazz, new age, Broadway, film music, and even soul. The contrabassoon rocks out on a tune called "I Feel Pretty Good" accredited to Leonard Bernstein and James Brown, while challenging Kenny G's reign over smooth jazz on "Contradance." His sense of humor, not to mention his virtuosic technique on this underappreciated instrument, make Savedoff's album a welcome relief in the all-too-serious new music scene. This could be a novelty album if it weren’t for the following facts. First the music is impeccably played by a group of outstanding musicians. Second, the arrangement of the music is articulate, interesting and without detectable defect. Third, the contrabassoon artistry of Allen Savedoff, is just that, artistry. I imagine that it must be difficult to play a contrabassoon like it is a saxophone but Allen Savedoff manages to do this very well. It must also be difficult to put together such a diverse array of instruments and make them sound so inevitable. Kim Scharnberg gets the credit for arranging all tunes except for Summertime and Kim’s contribution on that score is admirable. Mr. Savedoff also gets some sounds out of his instrument that are so organic sounding you will be looking for a huge snorting beast in your living room. Allen Savedoff has gathered together a great and a large group of players for this album. Each of the players is very spirited and the recorded music is layered and vibrant. I believe if you are going to do something that is musically different you want to have great material. Allen has chosen wonderful songs for this 56 minute recording. The CD opens with Brazil which is as catchy and listenable as any jazz standard. You will be amazed by the contrabassoon lead on this song. That big deep instrument is played with grace and agility. Next up is I Feel Pretty Good, a brilliant mix of Leonard Bernstein and James Brown which is pretty hard to describe but very easy to listen to. Then there are Summertime, Caravan, and Round Midnight. The list goes on. I spoke recently with the extremely gifted jazz vocalist, Rene Marie. She told me, this is not a quote, that she won't perform jazz standards any more because they are all used up. In Allen Savedoff's case that fortunately is not true. Allen has found room for fresh improvisation in the standards. This is an album that fills a self-created niche in my collection. It is the first contrabassoonist led Free/Avant Garde album I've ever heard and truly enjoyed. If you are a be-bopper or rocker who is thinking about going over to the Free/Avant Garde side this is a great bridge album. In all other cases it is just a very good, very listenable album. Copyright© 2005 JazzReview.com®. All Rights Reserved. Allen Savedoff is a self-proclaimed 'contra-nut', a passion which began at the age of 6 and continues unabated to the present! Nowadays, he can be found playing occasionally with the Hollywood Bowl Orchestra or the Pacific Symphony, and free-lancing in the Los Angeles area. In this CD Allen has teamed up with Hollywood and New York composer/arranger Kim Scharnberg to produce a delightful record of wonderful, generally well- known tunes featuring mostly contra, but some nice bassoon work-sometimes in multi tracks-as well. The entire CD is a neat celebration to the fun side of contra and bassoon playing. It is a joy to listen to! Most of the tracks are familiar tunes, from the rollicking opening cut of Brazil on the contra; to Bernsteins I Feel Pretty (Good) which starts with 'apologies' to the music for the movie 'Jaws'; to Victor Young's When I Fall in Love, Gershwin's Summertime Ellington's Caravan, Thelonius Monk's 'Round Midnight, Stolen Moments by Oliver Nelson; to Irving Berlin's Anything You Can Do (I Can Do Lower), which features two 'dueling' contrabassoons in stereo; to Kurt Weill's Speak Low, and finally to Joe Zawinul's rousing Birdland for contra, bassoons, stage band and piccolo. With the exception of Summertime (which is a sax piece arranged for multi-tracked 4 bassoons and contra by Bob Florence, all the arrangements are done superbly by Kim Scharnberg. Each one is quite original. Stolen Moments, for instance, is scored only for contra, marimba, and guitar-nice. There are even a couple of original Scharnberg compositions in the mix. The eighth track is a beautiful song entitled Vista, which Alan plays gorgeously entirely on the bassoon. The background also features female voices, and pianist Alan Steinberger, who provides a nice additional accompaniment and improvisation as well. Sure, it's all a bit 'Hollywood', but I love it! The other work by Scharnberg, Rumble, is a nice chance for the contra to act 'scary' by grumbling and grunting around, with a tuba added to the mix. Pretty 'serious' stuff!! I really like this CD. Even though it was definitely done in a studio and has that 'studio' sound, it probably had to be done there, due to the multi tracking at times and the probably pre-recorded big band behind a few of the tracks. With that, however, it is still pretty decently recorded, and balanced out extremely well. It's a great romp for Alan and his contra and occasional bassoon. The humorous program notes are also fun to read. I love the fact that we bassoonists (and contra-ists) don't take ourselves to seriously. We have our moments for seriousness, but we must never forget the 'play' part of playing our instruments. Buy this CD! It's a hoot!!! Yes, its corny, and it’s Jazz lite, and yes, it’s filled with schmaltz. But, hand it to Allen Savedoff. Ironically, perhaps, he’s done it all tastefully and appealingly, and this recording should help elevate the stature of his two primary instruments, the bassoon and the contrabassoon. Jazz bassoonists are rare, to be sure, but Savedoff puts the woodwind in an entirely new light by showing that it can effectively be featured in at least a smooth Jazz format. Although that alone might be deemed a significant accomplishment, there is more. Through the clever arrangements of Kim Scharnberg, Savedoff exposes the beauty of the bassoon’s natural sound, especially the lower register of the contrabassoon. Savedoff also shows that the bassoon can be a mainstream horn, capable of of being the leading voice in an orchestra. This is an important step in liberating the bassoon from its assumed limitations. When Savedoff, for example, leads on “I Feel Pretty Good” (a combination of “I Feel Pretty” and James Brown’s “I Feel Good”), he could almost be confused with a big-sounding baritone saxophone. Since improvisation is not his forte (he mainly sticks to variations on the melodies), Savedoff wisely chooses mostly popular and recognizable tunes, ranging from Monk’s “’Round Midnight” to Joe Zawinal’s “(Big) Birdland,” where the bassoonist husky sound focuses on melody and light soloing. Ultimately, the recording never rises above the level of good background fare, but with the lush strings on a couple of pieces, the subtle arrangements, and the focus on the rich tones of a powerful, often neglected woodwind, this is the sort of album that is almost curiously irresistible. Savedoff’s cute liner notes and re-titling of songs (for example, “Anything You Can Do (I Can Do Lower)”) remind me of Jon Rose, without quite the sophistication.